2. Look at the nearby surroundings of the venue - look for lots of quiet secluded spots away from guests and public. It's hard to feel relaxed in your couple portraits with onlookers. Nearby secluded spots means time spent making great photos not walking from the venue and back. 3.Choose a dress that suits you so well you feel totally at ease in it - then you will look great. 4. A perfectly fitted dress means you will photograph really well from every angle and in silhouette. Do have the dress adjusted, near to your wedding day. 5. If you're nervous about being photographed do an engagement shoot - your wedding day images WILL look more relaxed and therefore better. 6. Don't worry about doing silly stuff like tickling each other for couple portraits. Laughing people don't usually look great but the natural, genuine smiles after laughter always do! 7.Limit yourself to a small shot list of 5-10 family groups. Why? If the photographer is ticking images off a long list (s)he will find it much harder to document all the unplanned emotional events that tell the story of your day. 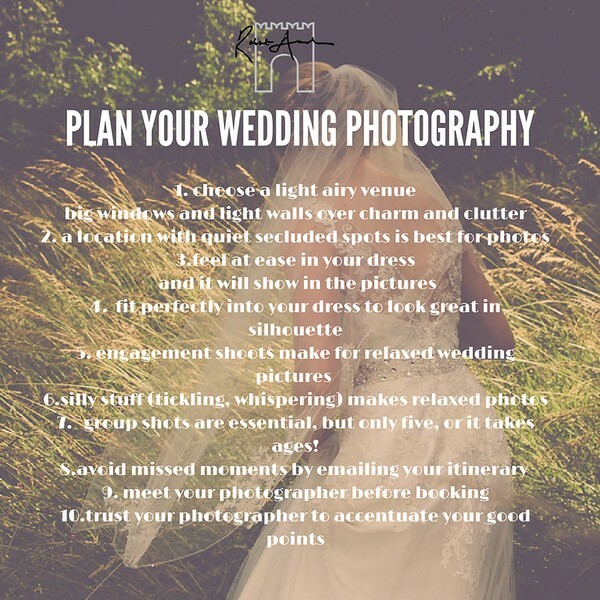 8. email your itinerary to your photographer and ring to discuss it to avoid missed moments. Being in exactly the right place at the right time is what makes great wedding pictures and it never happens by chance! 10. Trust your photographer to accentuate your positives and find your best angles.